Standard - $69.99 Only 2 left! For the busy, modern family that just doesn’t have time to decapitate zombies every night, HalloweenCostumes.com is proud to offer the Self-Decapitating Zombie: the latest in undead amputation automation technology. 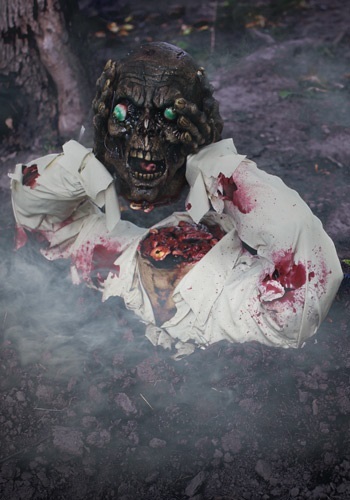 Don’t lose your head decorating for Halloween this year –– just add this Self-Decapitating Zombie to your decor, and let it do the rest! If you’re in charge of decorating for little Johnny’s classroom Halloween party, you might want to think twice before putting this in your shopping cart: it just might scare the bejeebers (our Scare-ologists assure us that’s the technical term) out of the K-6 crowd. If your job is to entertain and/or horrify tweens, teens or adults, however, this life-sized prop is sure to a be a delightfully gruesome hit. It will have the mild-mannered screaming and knocking their knees in fear. 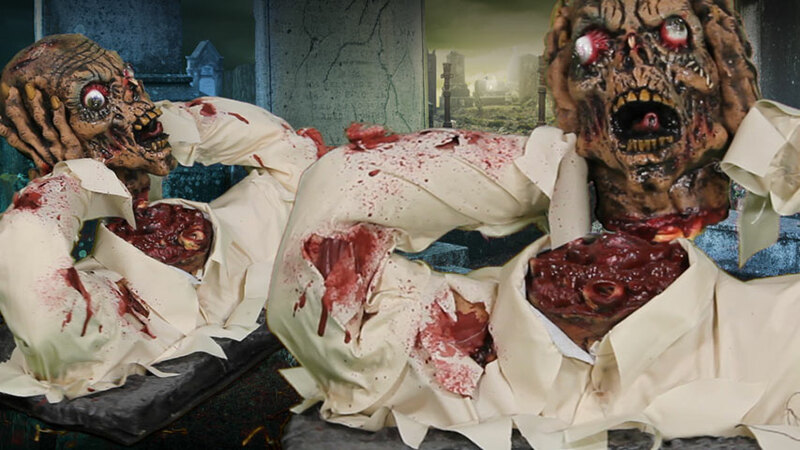 This electronic zombie decoration is life-sized and made out of heavy plastic. Why is this zombie offering his head to passersby? Well, when you’ve been buried from the chest down, you try getting your mouth closer to those delicious brains. The shoulders and chest of the zombie rest on the ground on a soft platform with the moving arms attached to the decapitated head––we’re not clear on whether this decoration depicts the victim of an execution or terrible superglue accident, but if you happen to glue your hands to the sides of your head, we recommend you pull outwards rather than straight up. On second thought, just go to urgent care. Don’t follow our advice. The shirt is torn and splattered in fake red blood.